NOTE: To map a drive using a Mac OS, click here. On your desktop, right-click on My Computer and then click on Map Network Drive. 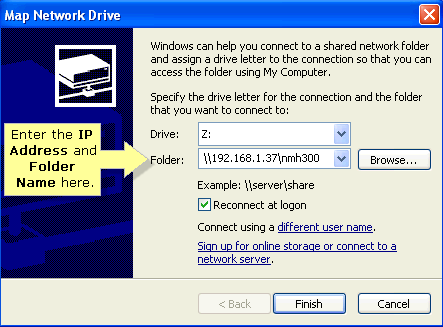 When the Map Network Drive window appears, enter \\<IP Address of Media Hub>\<folder name> in the Folder: field. 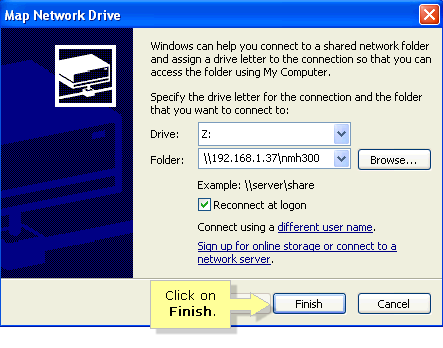 NOTE: You can also choose any drive letter of your choice. NOTE: The IP Address of the Media Hub will vary depending what IP Address is currently assigned to the device. NOTE: Make sure Reconnect at logon is checked. This will ensure that the connection is restored every time you turn your computer ON. NOTE: If you experience issues in connecting to the NMH, click here for assistance.